An excellent track within site of the M4 at Junction 17. This is a nicely turned out venue of around 400m that provides lap times of approximately 45-seonds and uses (for adults) the hugely impressive 270cc Sodi karts with adjustable seats and pedals, full wraparound safety system and fully enclosed rear axle. The venue offers a full range of events from 10-minutes arrive-and-drive right up to 2-hour team endurance races or Grand Prix events. There is also a full range of catering options and for the youngsters there are electric and cadet karts as well. Please note: All drivers are required to purchase a Race License at reception at the the cost of £3.00 for annual membership. The track is located about 1Km northbound from Junction 17 on the M4. For groups of 8+ drivers: Option 1, 10 minutes practice - 2 x 10 minutes qualifier - 20 lap Race, Option 2, 10 minutes practice - 10 minutes qualifier - 40 lap race, Option 3, 10 minutes qualifier - 60 lap race. A two-hour team endurance event. 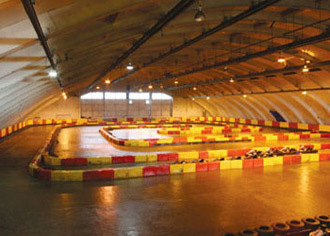 Qualifying to determine your grid position then a non-stop 120-minute relay event for teams of 4 drivers sharing a kart. Provide us with the details of preferred dates and the numbers in your group ands we will provide you with a selection of event formats to choose from. A variety of race formats are available for stag party groups or for birthday celebrations. Provide us details of your groups numbers and dates you would like for an accurate quote.